This entry was posted in Uncategorized and tagged bicikli, cycling, edzés, english, pb, phdinleuven, training on May 27, 2011 by Péter I. Pápics. I was not avare of the fact that it will be this hard. I though it would be a 1st category climb, with a much less steep gradient, so I was a bit surprised when I had to face reality. But it was a world class ascent. The worst part was between km 7 and 12 with the following gradients (over 1 km): 9.5, 10.8, 9.3, 9.0 and 10.1 percent. And to make things worse, as I entered the cloud layer around the elevation of approximately 800 meters (so around the beginning of the really steep part), the visibility dropped to 100 meters, and the temperature to 11°C. At the end of the steep section I have passed another cyclist (who was way older, so not because I would climb like Contador – at least I don’t feel the effect of the Spanish ham too much :D), with whom I had a short chat when he also arrived to the top. 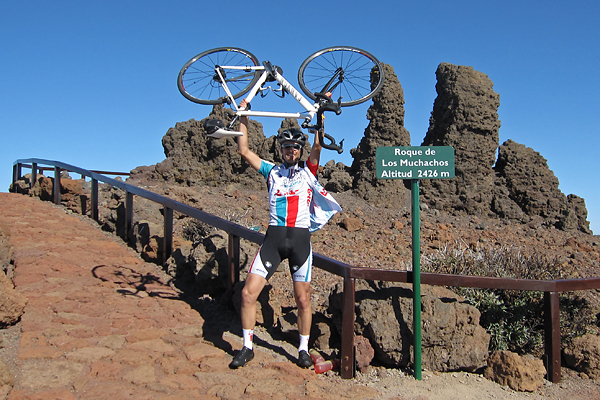 It turned out, that he works at the TNG, so it was a day of astronomers on bike ;) He also took a picture of me on the ‘summit’. 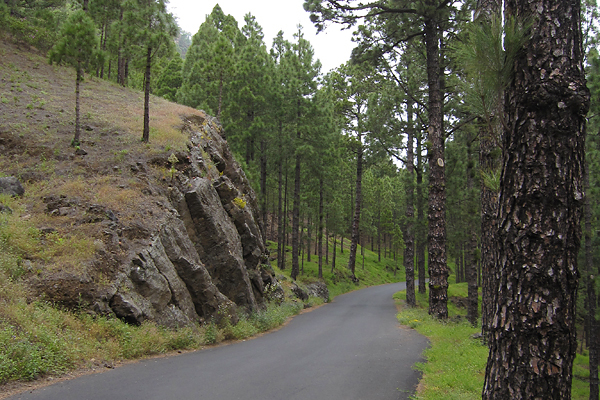 At the beginning the road was quite straight, climbing higher and higher on the left side of the valley among the so often seen pine trees of the island. A system of tubes carried down the freshwater from higher parts of the natural reserve along the road, and they were leaking here and there, but because of the tremendously high pressure, these leaks appeared as fountains of several meters high ;) The steepest one kilometer had a gradient of 11%, and that was the point where the road got very curvy. But it was a very nice climb, so it was worth going up. 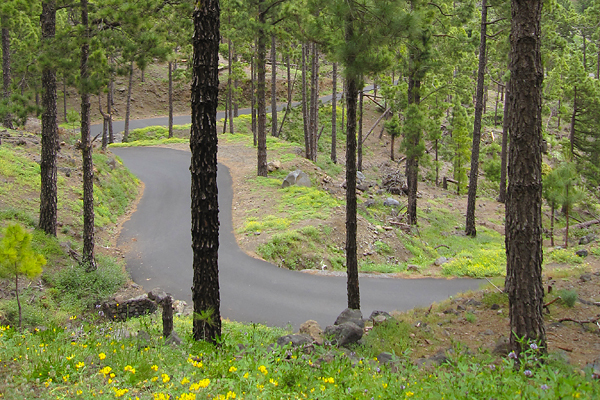 And the downhill was also very nice on the smooth and quite straight road ;) Then already after leaving the pine tree forest and the national park behind, I had a short period of sunshine when I could look back towards the caldera, but that’s the most I have seen that day. From here, I still had to climb back to El Pilar, up into the cold clouds, and now even facing the chilly and strong headwind. But it was the last climb. Luckily this side of the mountain was much easier, though the wind and cold made it a bit miserable. Also the road quality here was a bit below European standards. 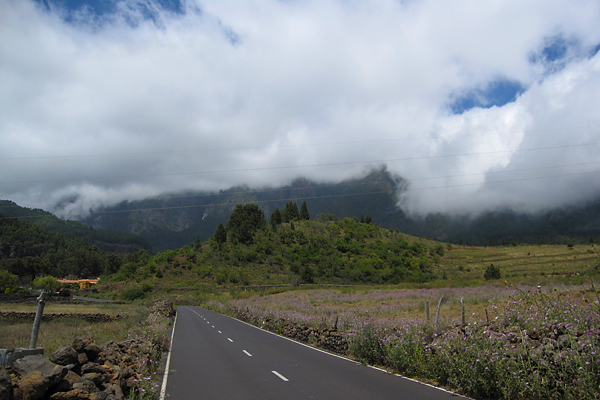 Unluckily I could not see too much of the numerous volcanic calderas which I have passed here, because all what I could make out was the grey slopes right next to me, but the rest was lost in the mist. I have to admit the situation had a special atmosphere, because the moving (more and less dense) clouds created the illusion of volcanic smoke. Again, on the top it was not more than 11°C, so the descent was freaking cold. 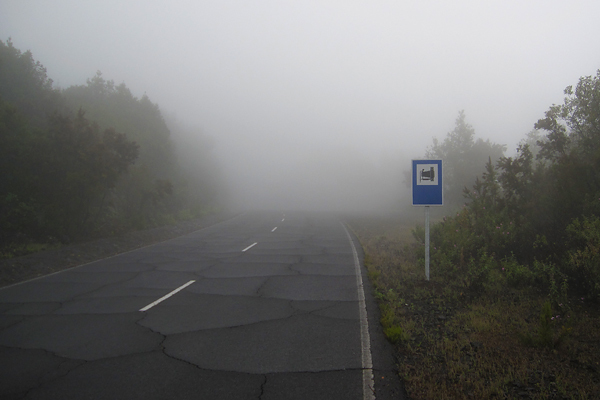 And because of the low visibility (50-100 meters all the way down till 750 m ASL) and the wet and steep road, I had to be very careful and break a lot. I did not enjoy it that much… But as soon as I came out of the cloud layer, it was a nice roll all the way to Santa Cruz (where I even had a bit of sunshine to close the day in a sunny mood). 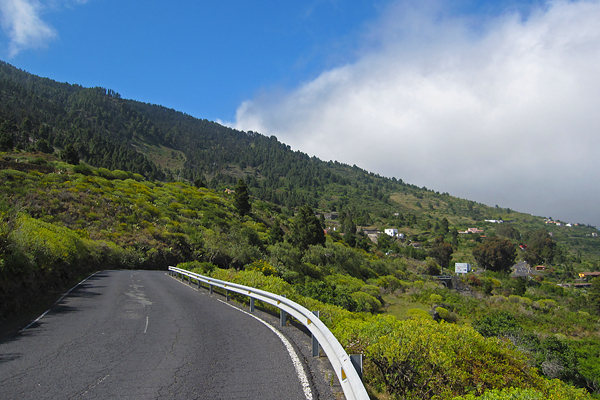 So I finished my last day on La Palma with 82.8 km and 2645 meters of elevation gain (and a pizza of course, as every day this week :D). Yeah, ‘easy day’ :D GPS details here. Luckily I specifically asked for a later connection in Madrid knowing that it is impossible to make it with IBERIA if you only have 55 minutes of transfer time, because now I am sitting in the airport of Tenerife, and we already have a delay of one hour… Yeah IBERIA, damn it! 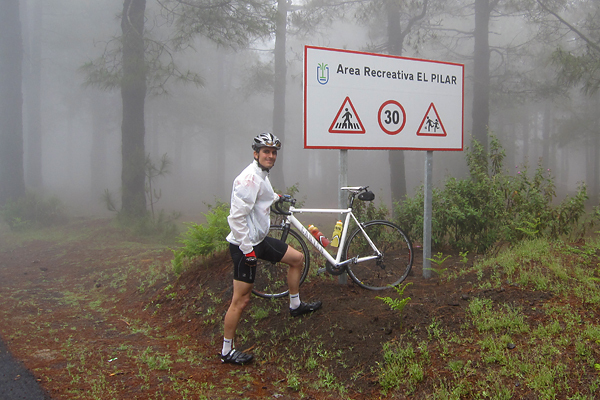 This entry was posted in Uncategorized and tagged bicikli, cycling, english, holidays, la palma, nyaralás, phdinleuven on May 24, 2011 by Péter I. Pápics. It is a long climb, but not too hard (the steepest kilometer is only 7.8%, and there is no other over 7%). I knew the rod till Barloveneto from last year, but back then I continued on LP-1, and now I took a smaller road (LP-111) which goes a bit higher up. This was a really nice part, with perfect road quality, only one lane, small and dark tunnels through the steep ridges, and with a real rainforest around. So soon after hitting the 60 km mark, I already had more than 2000 meters of elevation gain in my legs, which was pretty reassuring given that it was almost 2/3 of the total, while I was not even halfway into the total distance. (Yes, the first part was pretty hard.) I passed the point where last year and two days earlier I turned left to climb (or continue to climb) up to the Roque, but this time I continued straight on. Soon the highly anticipated descent started (with lots of curves in the first part, where my brakes were really loud for some reason), and the sun appeared from behind the clouds too! It was almost continuous descent from an elevation of 1200 meter to 100 meter (except for that tricky climb gaining ~200 meters in elevation in the middle), through really nice landscapes, and really great views down towards the sea in the valleys. 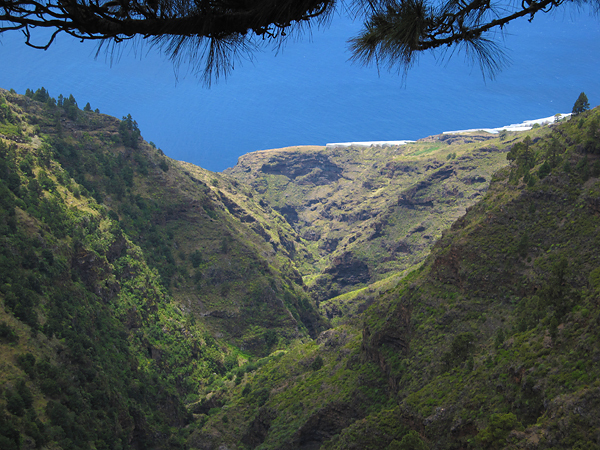 One of the most interesting sights was the El Time lookout point, on the edge of a huge canyon which connects the port of Tazacorte with the Caldera de Taburiente. 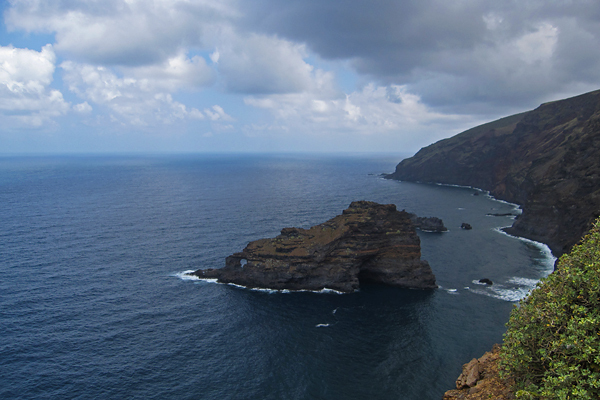 In optimal conditions, I could have just looked up all the way to the Roque de los Muchachos, but unluckily now it was hiding behind a massive layer of clouds. Still the view to the canyon and the curvy road down to its bottom was quite spectacular. With only the first 4 kilometers having a steeper gradient than 5%, and the rest typically around 3%, it was an easy climb, though the headwind and the fact that I already had lots of kilometer and climbs in my leg made it slightly harder than it might seem to be from the plain numbers. I biked through banana fields, then the colorful city of Los Llanos, from where I continued my journey on the LP-2 road. 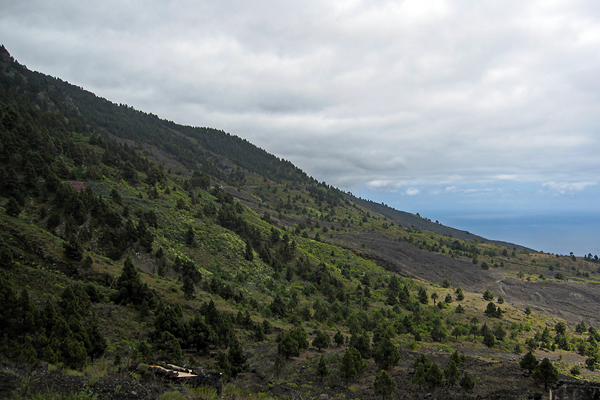 At the final kilometers of the climb, I reached the famous lava flows (of course they are not really flowing anymore) of this (southwestern) side of the island. This was again a memorable part of the day, with not just the grey volcanic rivers of rock, but also the rich vegetation around. Pine trees, cacti and colorful flowers everywhere. 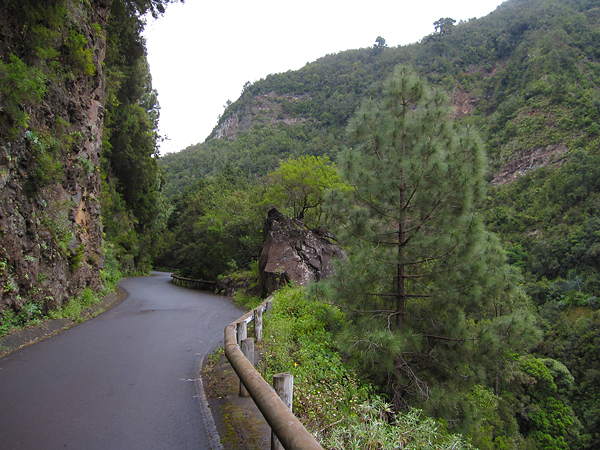 Also the road quality was nice, and the car traffic was extremely low (as it is in general on La Palma). It was really interesting to see how the lava flows solidified, preserving the shape of collapsed channels all the way down towards the sea. 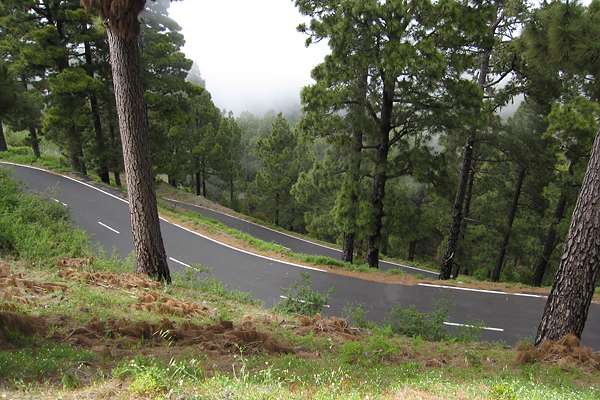 Then the road turned downhills towards Fuencaliente. From there, I took the same road back to Santa Cruz as on my first ride. I even had a bit of sunshine at one point! 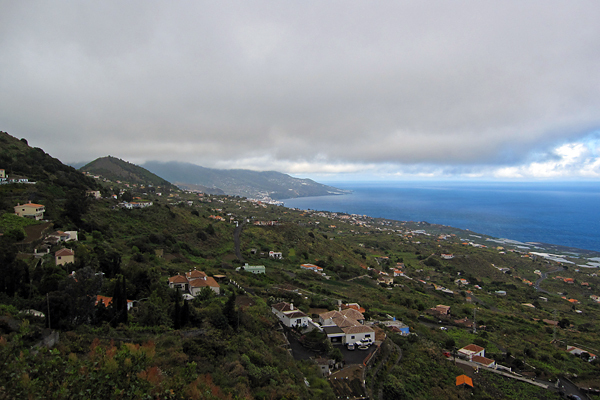 Then I stopped once in Villa de Mazo, because there was a nice view towards Santa Cruz, from just below the cloud layer. It is shocking how deep blue the ocean looked as the clods were only staying above the island, so the reflection of the sky was visible on the open waters – and the fact that the water surface was lit by sunlight made the contrast even bigger. Also the airport was well visible from this point. Then on the last descent (the curvy road along the remnants of an old caldera just above Santa Cruz – I have climbed it on Day 1, and then on Day 4 again), when I was already happy about accomplishing another big ride, in one curve three dogs started running towards me while barking loudly, so I got a half heart attack meanwhile I was trying to avoid running into the dogs… It was a quite close call (and I can only hope that the Spanish lady was shouting “leave him alone” to her dogs, and not “catch the cyclist” :D). 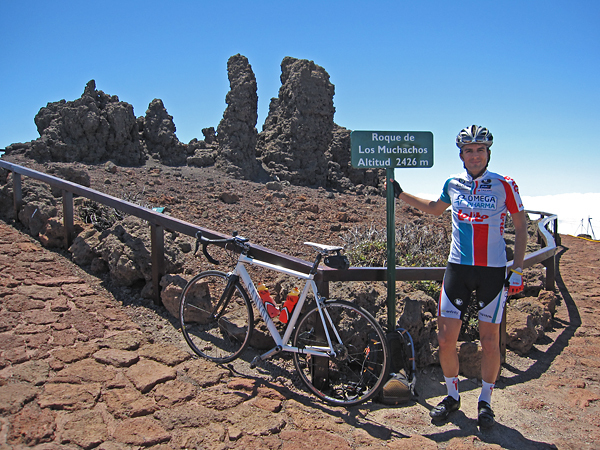 So I arrived back to La Palma after 154.1 km and 3246 m of elevation gain. 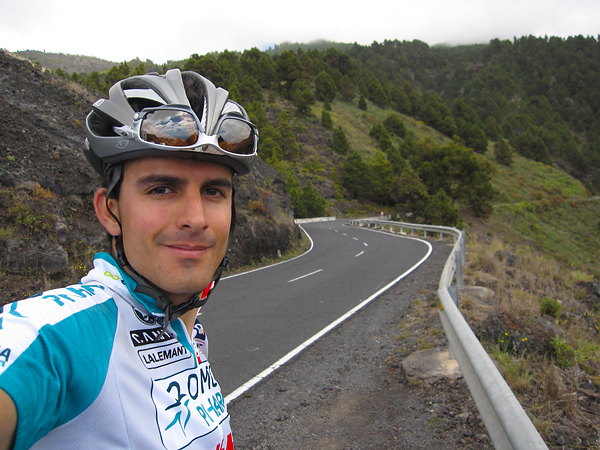 It is really amazing, that I just rode around the island and still I had more than three kilometers of elevation gain. 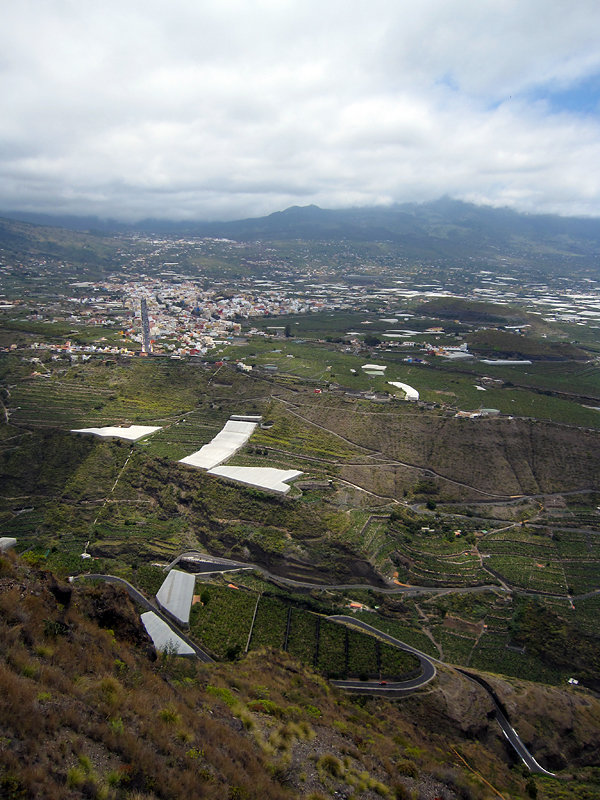 No wonder La Palma is known as the steepest island of the world. Even if you go around, you can not just follow the shoreline, because sometimes even the lowest road has to go over a 1000 meters in elevation, to make it through a lava flow, or a gorge, or a ridge… But again, it was an epic day! (And again, I had company from the NOT for dinner, so no eating alone!) GPS data of the day can be found here. 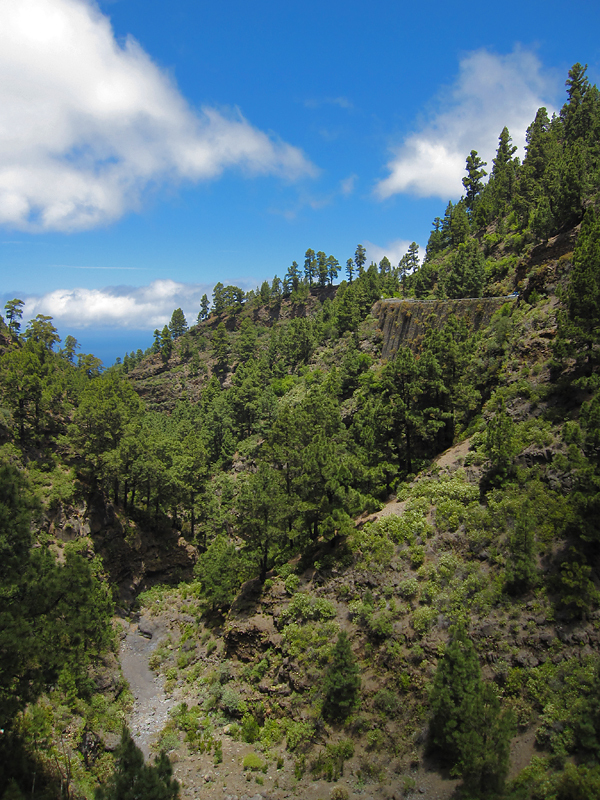 This entry was posted in Uncategorized and tagged bicikli, cycling, english, holidays, la palma, nyaralás, phdinleuven on May 23, 2011 by Péter I. Pápics. I also refilled my hydration pack with water (and Isostar) here – although my two 0.75 liter bottles were still full. (It is so nice to climb with some excess weight, isn’t it? 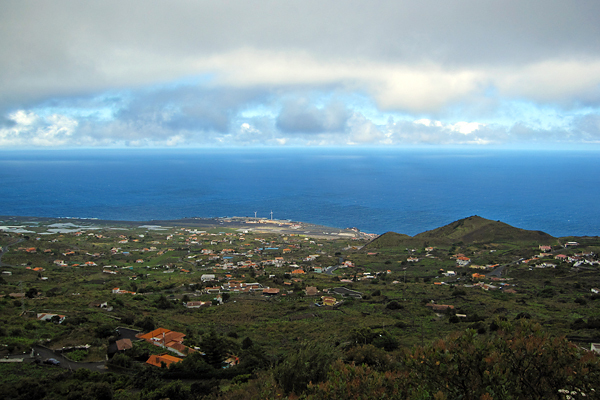 :D) As the weather was really chilly (and cloudy towards the north side of the island), I got my knee and arm warmers, my wind west and even my rain jacket (still only against the cold wind) on, before I started my descent towards Garafia. Still, I was honestly freezing downhills. Cutting through 13°C air with 50 km/h feels really cold… It was a real revival when I finally reached to the lowest possible point on this side of the island (a lookout point on the edge of the cliffs below Garafia), where the temperature was 25°C. And the view (plus the plants; bushes, flowers and cacti) was also quite spectacular. The way down (with still a 4th category climb soon after leaving the territory of the Observatory) was cold (again) and uneventful (no torrential rain or dogs attacking), but beautifully clear and sunny, with nice views onto Santa Cruz from the hillside. I could even ride onto the fresh asphalt (where the road was still blocked on the morning) and enjoy a smooth roll during the final kilometers. On the evening I had dinner with a colleague from the Nordic Optical Telescope, then I went to bed after watching the Tour of California for a while on TV… It was a really crazy but awesome and epic day of 147.4 km with an elevation gain of 5069 meters! GPS data of the day is here. The next day I did not go anywhere, just stayed at home, watched the Giro and ate a lot :D Oh, and on the evening, I had dinner with now all the people from the NOT! 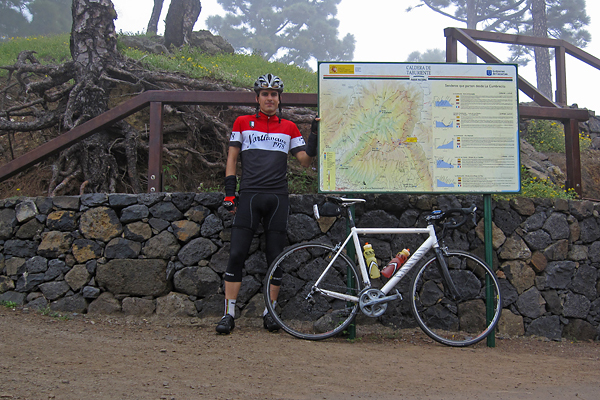 This entry was posted in Uncategorized and tagged bicikli, cycling, english, holidays, la palma, nyaralás, phdinleuven on May 22, 2011 by Péter I. Pápics.